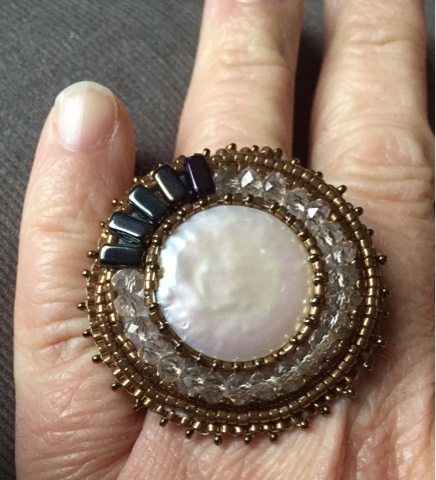 About a year ago I was inspired by a huge Art Deco-style cocktail ring I saw in a magazine and decided, since I was busy creating bead embroidered vintage buttons, to adapt the technique to a ring that riffed on the jewelled one I coveted. Here's how I did it. I chose the flattest coin pearl from a strand of them. It had a slight pinkish tint to it but also had flecks of gold and so I got busy and looked through my stash to find some coordinating seed beads and crystals. The picture above doesn't pick up the subtle pinkish hue of the crystal bicones, unfortunately. Step one is to glue the coin pearl down to stiff beading medium, such as Lacy's Stiff Stuff. I glued it to a 2" x 2" piece and let it dry thoroughly. In step two, I started my thread from the back and made a few anchoring stitches through the coin pearl. Then I stitched two rows of size 15 delicas around it, with a third step up row of size 15 seeds in the same bronzy colour. This created a bezel around the pearl. The next row was crystal bicones and, since I wanted to throw in some visual interest, I added the challenge of working in, and around, five half tila beads. They naturally fan out, so my next row picked up the same delicas from the first row to frame the crystals while spacing out the fanned half tilas between their second holes. One more row of delicas was added to give a smoother edge and finish off around the tilas. Next, I trimmed off the excess backing fabric being careful not to cut any threads - always tricky because you don't want too much extra material around the edge. I then used the finished shape to trace a backing piece from deer tan. It's soft and supple. I found an adjustable ring shank, cut a slit in it to allow the round metal disk on the front of the ring to slide through. 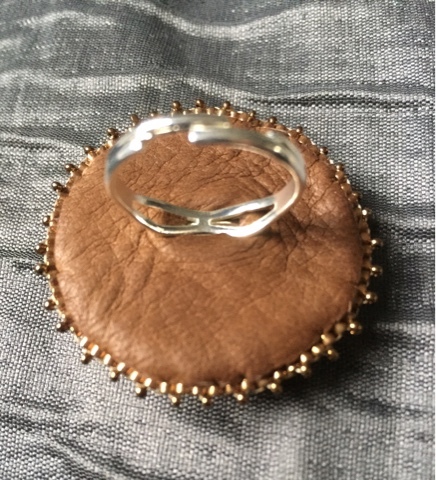 I fitted the ring shank into the deer tan then glued both the metal disk and deer tan to the backing fabric. After it was dry, I used the same size 15 delica and seed beads I framed the coin pearl with to create a picot edge around the ring to finish it. If you need a refresher on creating a picot edge with beads, google "beaded picot edge" with the word Beadaholique and you'll find a great You Tube video. And that's it! I have a one of a kind cocktail ring that I love to wear. If you make one, post a pic!